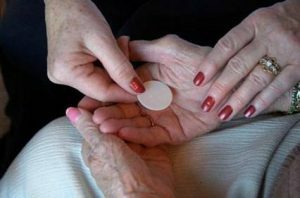 Eucharistic Ministers to the Sick assist our priests in bringing communion to parishioners who are unable to attend the Eucharistic celebration due to physical ailment. This ministry focuses on Catholic individuals who are admitted to hospitals, nursing care centers, hospices, or confined to their home. In addition, they visit pregnant mothers in the hospital to deliver communion. If you are being admitted to the hospital or are unable to attend Mass for some reason, please let the parish office know so that a minister to the sick can provide the Holy Eucharist. The Ministry always has a place for you if you are interested in serving. Mandatory training will be provided. For more information or to serve, contact the Ministers to the Sick.